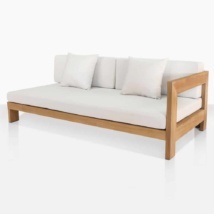 Build your sectional sofa: 1 Coast Teak Daybed (Left) and 1 Coast Teak Daybed (Right). Ever feel like relaxing in style? Want somewhere you can lay out and enjoy your blissful surroundings but also host many friends for light meals, cocktails and parties? 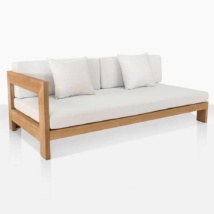 Presented in a sleek, lustrous and versatile design; the Coast Teak Outdoor Furniture collection is a modern classic. Pair up sectional pieces for a precise, angular shape or create a long, dreamy sofa. 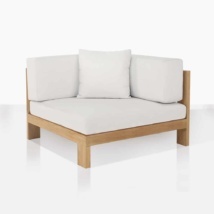 This chunky sectional set is polished, sharp and modular. Its versatility allows you to make it as grand or small as your outdoor space will allow! 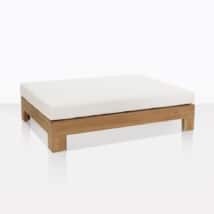 The wide cushions and seat depth are sublimely comfortable and perfect for lounging outdoors. 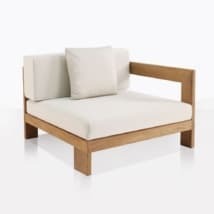 Featured in the powerful, accomplished and functional Coast Teak Outdoor Furniture Collection is the Coast Sectional Center, Coast Corner, Left and Right Daybeds, Coast Outdoor Lounge Chair, Outdoor Ottoman and Coffee Table. Want to a dramatic ‘C’ shape? 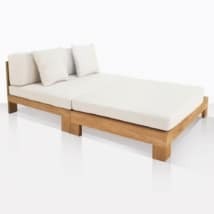 Start your ‘L’ : with two Coast Centers hard up against a Coast Corner, place a Left Arm Daybed on the other side of the Corner piece. 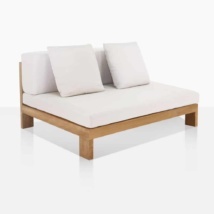 Place a Kingston Cantilever Umbrella next to the arm of your Daybed and two Coast Chairs facing in and voila! A dynamic, welcoming space for you to host friends or just enjoy the contentment of your great outdoors! 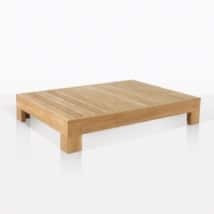 Mix and match Coffee Tables to go for an eclectic look, or keep it simple with the Coast Ottoman which doubles as a fabulous Coffee Table! Want a long, classic sofa? 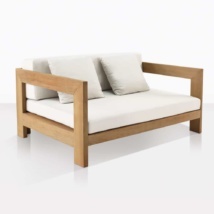 Simply place a Left and a Right Daybed against each other and finish off the look with a couple of C-Tables. 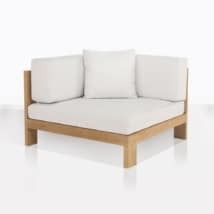 Not only does it create a space for you to lie down in divine relaxation but you now have a 6-8 seater sofa! 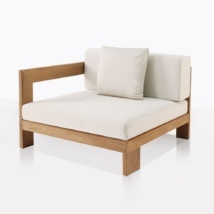 At Teak Warehouse, all our Teak Deep Seating is made from A-Grade Teak – long lasting, strong and utterly gorgeous!